During the scorching summer months, the last thing you want is for your car’s air conditioner to break down – especially if you’re on a long-awaited family road trip. That’s why it’s important to make sure your system is in good working order before you hit the road. Unfortunately, unless you’re a mechanic or an HVAC tech, you may not be sure where to start. 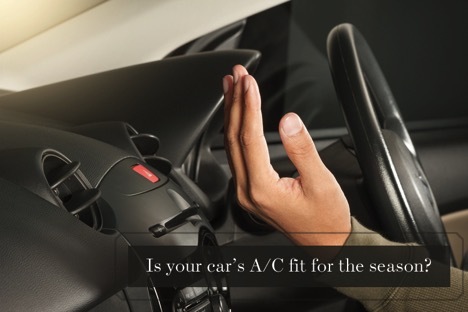 Luckily, there are a few easy steps you can take to make sure your car’s A/C is fit for the season on your own – but be sure to stick to the detection side. As a mechanical process, air conditioner repair can be both complicated and dangerous, so leave that part to the professionals. As the summer gets rolling, it’s time for you to pop the hood, open the vents, and check for these five signs of a properly working system. From there, you can decide whether your car is due for a tune up or is ready to cruise in the summer sun. When you turn your air conditioner on at the start of the season, does it make any unusual noises? Your air conditioner shouldn’t be loud – it should just hum in the background. If you hear a lot of noise or banging when you turn it on, there may be something malfunctioning internally. Many of us think that air conditioning naturally smells a little strange, at least in the sense that it doesn’t smell the same as the air outside. But your air conditioner shouldn’t cause your car to smell musty or otherwise unpleasant. Rather, the smell of the circulating air should be essentially neutral. There may be residue, dust, or even mildew built up inside the system if the air that comes out smells like the inside of your attic or seems to trigger allergies and asthma. The refrigerant inside your engine is one of the most important parts of your car’s air conditioner, and it’s very important that the liquid refrigerant stay dry. When wet, it reacts with water to create corrosive hydrochloric acid that can harm your engine. You can check on the status of your refrigerant by looking into the sight glass under the hood – find this by following the hose connected to your condenser. When you look through the sight glass, the liquid should look clear. Milky or bubbly liquid means that either water or air has gotten into your refrigerant and you’ll need a mechanic to replace it. A properly functioning air conditioner system should be able to keep the inside of your car 50 degrees below the outdoor air temperature. 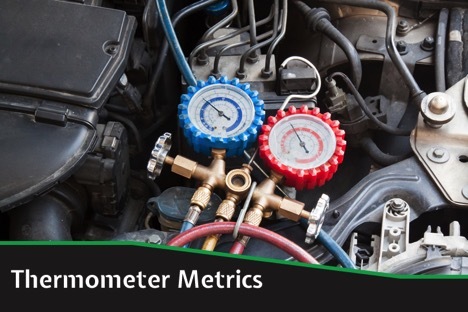 This may seem like a lot, depending on where you live, and few of us are using our air conditioners to drop a 90 degree car down to 40 – that would be excessive – but this can be a good metric for proper functioning. Bring a thermometer out to the car and check your area air temperature. Then run the car’s A/C for a period of time and see how quickly the temperature declines. If you’re not seeing a relatively rapid shift downward, your system may need some maintenance. Some air conditioning issues may not be noticeable until you take your car out for a drive, so just turning on the system won’t be enough. Instead, turn on the air and drive for 30 minutes or so, while keeping an eye on your engine temperature. Using your air conditioner can sometimes correlate with an overheated engine and that may be caused by a malfunctioning thermostat, coolant leak, or one of several other possible problems. If you notice any problems after reviewing these five factors, then it’s time to take your car in to see the mechanic. Air conditioner coolant can be toxic, so you shouldn’t try to replace it yourself, especially if you have an older car that’s still using Freon. On the other hand, if you’re using a newer system with R-134a, you’ll need to combine it with the appropriate amount of oil for the system to run smoothly. Getting the balance right between refrigerant and oil should be left to the professionals because the oil helps the car’s compressor run smoothly. Without enough oil, the compressor can break down and you’ll need to replace it at significant expense. Better to let someone who knows the system take care of it. Your condenser can also be harmed if banged around by rocks while driving, so if you know you’ve been on dirt roads or been in an accident lately, don’t forget to have your condenser looked at. In some cases, your air conditioner may be working fine, but you may not be using it in the most effective manner. During city driving or while sitting in traffic, for example, opening your windows cools the car more effectively than using the air conditioner. On the flip side, when driving quickly along a highway, open windows will cause excess drag and the air conditioner is more effective. Another small shift that can improve your system’s performance is knowing when to use the “fresh air” setting and when to put your system on “recirculate.” When it’s very humid out, recirculating the cooled air is more efficient and will make the car more comfortable, since your car won’t be fighting to remove the moisture out of fresh air. Adjusting your settings based on these surrounding factors can improve your driving experience. Before you head out for your summer vacation, bring your car by The Garage Auto Repair for a full work up. We can adjust your system pressure, add new refrigerant, and make sure you don’t have any leaks in your system. Don’t risk a breakdown on the road – call us today for an appointment or just stop by. 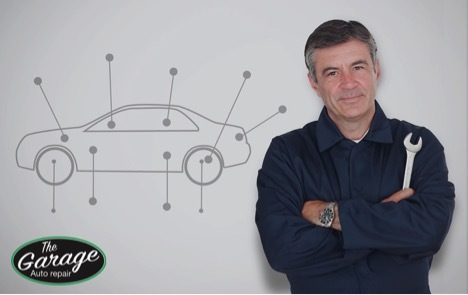 Driving a well-maintained car is a joy, so let The Garage team help keep it that way.